It's that time of year... back to school supplies are in stores and that means school will be here before we know it. For all those out there enjoying their last summer before starting law school, I am going to hit on a lot of the questions I get about starting 1L year in the next few weeks. First up, what is the first day of law school like? Let's be real, people... my first day of law school was a while ago... like almost two years ago. However, it was a pretty monumental event so I remember it pretty clearly. I was so stressed out going into 1L year. I tend to be an anxious person by nature and I overthink everything. So naturally, starting law school had me all in a tizzy. In reality, most of what I was stressed about was not really cause for concern... but it sure didn't feel that way at the time. For all those out there who are gearing up for law school this fall, I hope this helps to ease any anticipation jitters or nerves about your first day. I stressed myself out about every little detail of starting law school: what should I wear, what bag should I use, handwritten or computer notes, would professors cold call, would the other students be nice, should I pack a lunch... and so on. When I say I stressed about everything, I mean everything. It is partially my nature to stress about every little thing and it was also partially because law school is such a huge undertaking and the doorway to my chosen career. I read everything I could find about what the first few days would be like to try to prepare myself. 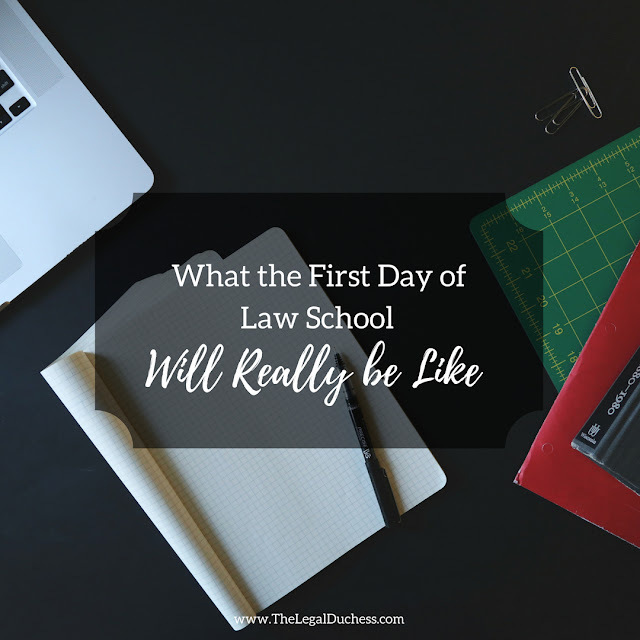 Thankfully, all my stressing was for almost no reason and my first day of law school was pretty painless (you can read all about it here: My First Day of Law School). For all those who stress about the details just like me or those just wondering, I am going to outline what to expect from your first day. I polled some of my law school friends, as well as taking my own experiences and observations, to get this. I am sure that I will not cover everything and some people will have or have had very different experiences but I am going to try to hit on the big and general stuff to expect and be honest about it. The first day of law school is full of a whole bunch of awkward. You are in an unfamiliar place, doing unfamiliar things, under a lot of pressure, with a bunch of people you don't know.... recipe for a lot of awkwardness. Everyone will be in the same boat so just roll with it. The awkwardness will fade away after the first few days- I promise! Your first day of law school will probably be stressful... and that's okay. You are starting law school and that's a big deal. You don't know what to expect, you are in a new place, with new people, learning new things.... #stress. It is a big undertaking to begin law school and that can be very stressful and that is normal. However, the stress will probably ease the longer you are in law school... or at least it did for me. However, while some stress is normal and perfectly okay, don't let the stress control you. Try to enjoy your first day and relax. Keep the big things big and the little things little. You are going to learn... like a lot. Soak it up; take it in; after all, you are in law school to learn first and foremost... so that should be your number one priority. I was amazed by how much information was in my brain after my first few days of law school but I also kind of loved it. I love learning so it was a bombardment of information but in a good way. The first day of law school can be trying but you will survive and it will get better with time. Someday you will be a fancy lawyer and the first day will seem so long ago and no big deal at all. So keep the little things little and the big things big- you are in law school for an education and one rough/awkward/stressful day is not the end of the world. Be prepared- do your reading, have notebooks or your computer to take notes and be ready for what the day may bring. You do not want to be that person who didn't read and isn't prepared- trust me that is super embarrassing. Arrive early- parking lots and classrooms will fill up fast as everyone is nervous and trying to be on the ball. Arrive early so that you are not stressed about not finding a seat or a parking space. Many professors assign seats the first day so make sure you get a seat you will be happy with the whole semester! Don't stress about the little things- if your pencil breaks or you trip on the stairs, it just doesn't matter. Everyone will be so wrapped up in their own day, they won't even notice. You will survive the dreaded cold call- if you happen to be the person called on in the first class, it will be fine. No one will be judging you- they will just be thankful it isn't them. As long as you don't answer "I didn't read", you can't go too wrong. and then think how empowering it feel to survive your first cold call?!? You will make friends- law school is very competitive but it is also full of a bunch of nervous, stressed out people who don't know what to expect. That is a breeding ground for friendship... one of my friends calls this "social anxiety friendship" which is when you are nervous and anxious about a situation and find someone else feeling the same way and cling to each other in mutual stress and anxiety and a friendship begins. That's pretty much exactly how I made friends in law school and they have been wonderful! It will get easier... just like anything, time and experience will make it easier and less scary. After a week or two, you will feel right at home. Bring your books and take good notes- even on the first day, you will be learning! Be nice to everyone you meet- even if they don't end up being your law school BFF, it's always good to be known as a nice person. Law school is a professional school and it is the beginning of your professional legal career so act professionally. Enjoy the remainder of your summer and try not to stress too much (I know, easier said than done)!